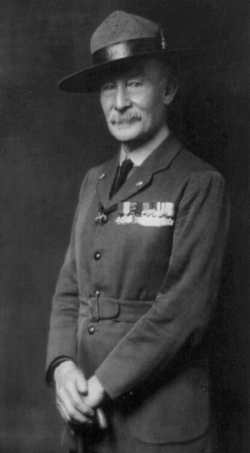 Robert Stephenson Smyth Baden-Powell, 1st Baron Baden-Powell, OM, GCMG, GCVO, KCB , also known as B-P or Lord Baden-Powell, was a lieutenant-general in the British Army, writer, and founder of the Scout Movement. After having been educated at Charterhouse School, Baden-Powell served in the British Army from 1876 until 1910 in India and Africa. In 1899, during the Second Boer War in South Africa, Baden-Powell successfully defended the town in the Siege of Mafeking. Several of his military books, written for military reconnaissance and scout training in his African years, were also read by boys. Based on those earlier books, he wrote Scouting for Boys, published in 1908 by Pearson, for youth readership. During writing, he tested his ideas through a camping trip on Brownsea Island with the local Boys’ Brigade and sons of his friends that began on 1 August 1907, which is now seen as the beginning of Scouting (Boy Scouts).